You must use Duo authentication to log on to Flux. For more details and to enroll, see https://www.safecomputing.umich.edu/two-factor-authentication and in particular, the Getting Started section. You need to have a user account to use Flux. Apply for one using this form. You need a terminal emulator to log into Flux. This video will help teach you some basic Linux navigation commands if needed. 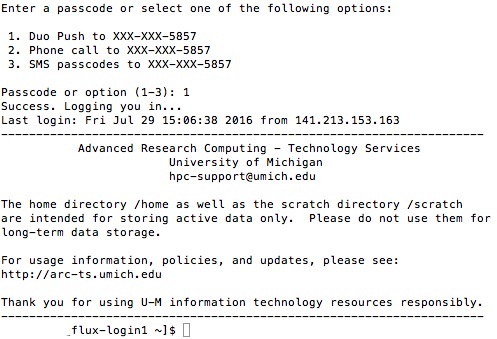 First ssh to login.itd.umich.edu, then ssh to flux-login.arc-ts.umich.edu from there. 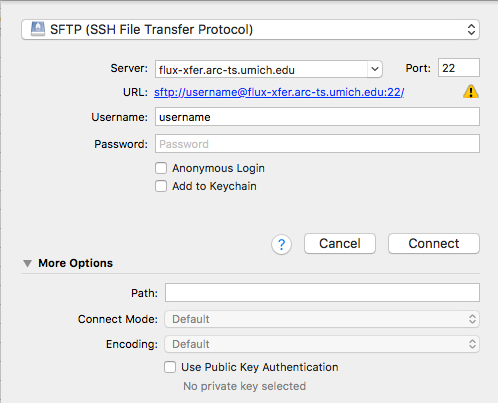 Launch Putty and enter flux-login.arc-ts.umich.edu as the host name then click open. Open Cyberduck and click the Open connection button. Set your Username: to be your uniqname. Drag and drop files between the two systems. Click the Disconnect button when completed. Globus is a great alternative especially for large data transfers. Learn more at the Globus web site or this how-to video. nano is an easy to use editor available to edit your files on Flux. The cluster requires some information to wrap your code so that it can submit your job for execution. Wrapping these jobs allows the Flux scheduler to fits jobs to available processing on the system. This means you must make a batch file to submit your code. You can submit your job and check its status in the queueing system by using the commands below. If a job doesn’t start in within 30 minutes, send an email with a copy of your PBS script and the job number to flux-support@umich.edu. Do not delete the job. Exit_status=0 means “OK.” Anything else indicates an error occurred when running the PBS script — check the PBS output and error files to see what your program said about why there was an error. Please see our table of return codes for some information on interpreting the return codes. resources_used.vmem=770420kb means your job used a total of 770 MB of memory. This may be used to revise your memory estimate for future submissions. resources_used.walltime=00:00:13 means your job took 13 seconds to execute. This may be used to revise your walltime estimate for future submissions. If you have specified the -j oe option in your PBS script, all script output and error message output will appear in a file named jobname.ojobid in your submission directory after the job completes. In the above sample, the output generated by your batch script (here “Hello, world”) will be placed into the file sample_job.o11800755 .